The lovely river Lee runs prettily through Cork city into the Irish Sea. Inland it is fed by tributaries, one of which is the Sullane which runs through Macroom and Ballyvourney. In turn the Sullane is fed by innumerable streams and rills which, even in the driest summers, make their way down over the rocks and the high pastures of the mountains which mark the Cork and Kerry border. I gasped for more than one reason turning around after a relentless 30-minute uphill slog out of Ballyvourney in the late afternoon sunshine. I contend that no photographer or artist could fully capture the awesomeness of the Irish countryside in the way it was set out before me right then. Another fifteen minutes might have brought me up to the highest point but I want to live to fight another day. Ballyvourney is the centre of Cork’s little enclave of the Irish-speaking Gaeltacht though, like Jerriais, it is no longer used as an everyday language. The Mills Inn was established as a coaching inn in 1755. Today it seems to be the go-to venue for every family in the district, together with those travelling to or from Kerry. Seeking a quiet pint and a bite to eat I came downstairs to be greeted by a vision of Hell; mothers, fathers, babies wailing, youngsters flying around the place, chips with everything being dispensed, bedlam. I abandoned ship. A long walk back down the road was the Abbey Hotel – also catering for families it was at least quieter and lower key. I gratefully ordered my first pint of Murphy’s (€3.75) and a portion of curried chicken with (yes) chips! More relaxed now I ventured onwards in the fine evening and, at last, a proper Irish bar, The Hibernian, with no children, good West Cork craic, footy chat (despite all of Cork’s senior GAA teams having been dumped this season) and a good pint of Murphy’s, again €3.75. Back to the Mills ready for bed but, what was this? A shout out for Firedrill, a local rock band who were playing covers in the courtyard under clear skies. No great shakes but they were up for it, had no pretensions and finally had a few of the locals up lepping about to their closing numbers. But why does everyone and his dog think that they can perform Romeo and Juliet, one of the great love song classics of our time? Lads, stick to the louder stuff. The following day another good run of about an hour looping across the other side of the Sullane valley. Then, in the company of an old friend Joan, a short trip to take in the area’s most religious spot. 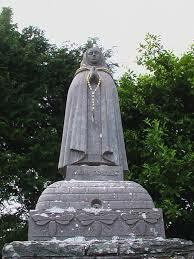 St Gobnait is the top girl around these parts and she is buried in a quiet spot nearby. All manner of legends surround the woman concerning deer, bees and plagues. There’s her statue above the grave, together with the first of two holy wells. Nearby a church with churchyard, and I’m a bit of a cemetery geek. Down the hill is a second holy well. There’s a remarkable collection of votive offerings, small tokens left by worshippers – scarves, ribbons, photos, tacky religious memorabilia. It’s a sign of how deep religion still cuts into the population despite the near-dismantling of the edifice of the Catholic church in recent scandal-hit years. Finally there’s a Penal Mass altar, an example of how Catholics were forced to worship in secret during the Penal Law years. Occasionally one finds and old blog and thinks it’s worth re-blogging. Here’s one I like from a few years back. Thanks for letting us tag along, Roy. I enjoyed this post very much! Morning Naomi, good to hear from you. Yes that was a nice couple of days out in West Cork there in 2011. I had intended to write but the place was so gorgeous that I couldn’t sit inside for very long! You were out there filling up your story bank! Library shots Jill which I really should attribute. I’ve got no photography skills. But honestly it was well worth the effort to get the views that day. Great sense of place, Roy. So glad you posted this one. Hello Jean and thank you. Yes it’s an idyllic part of the world out that way. That and Gougane Barra which I visited on the way back towards Cork city. Sounds delightful! I must check it out! Have you ever considered doing travel writing? You are very good at the atmospheric descriptions! Thank you SV – yes the border country between Cork and Kerry is wild and gorgeous. But you made me laugh – I must be the most un-travelled person around. Even your stories about County Limerick make me realise how much I haven’t seen.